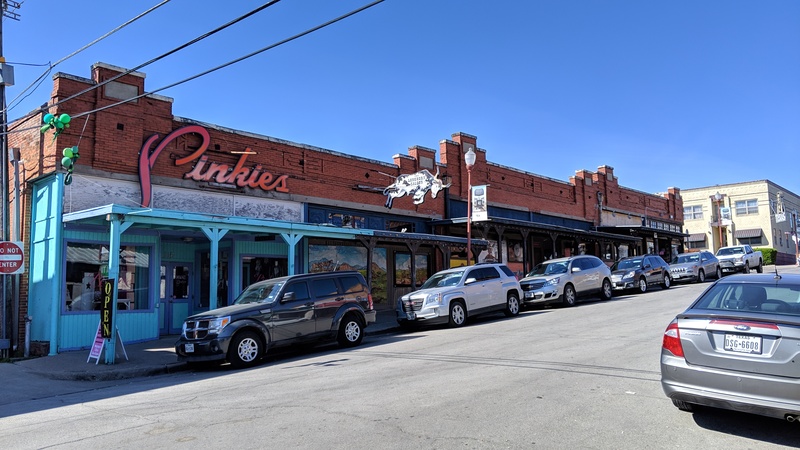 There are lots of shopping and restaurants that dominate this area. Being a big tourist destination I can’t say I blame them. 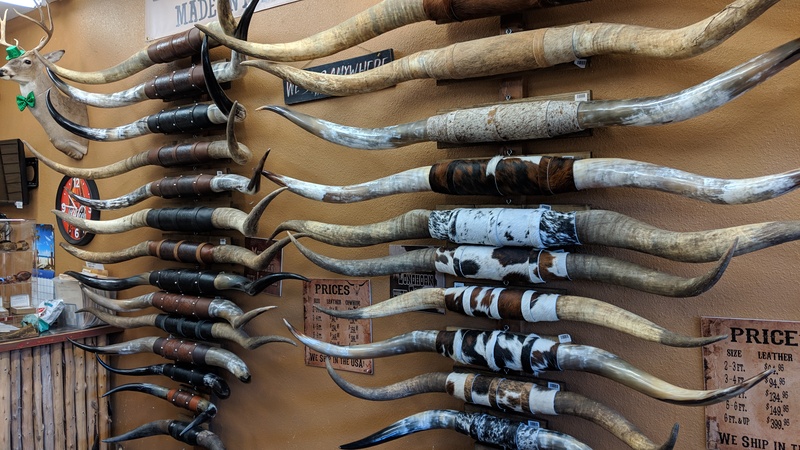 You can get the traditional t-shirts and hats and cowboy boots but you can also find more unique items such as these long horns. What do you think? Should we have bought one to put on the front of the coach? But it’s not all just tourist shopping and restaurants. 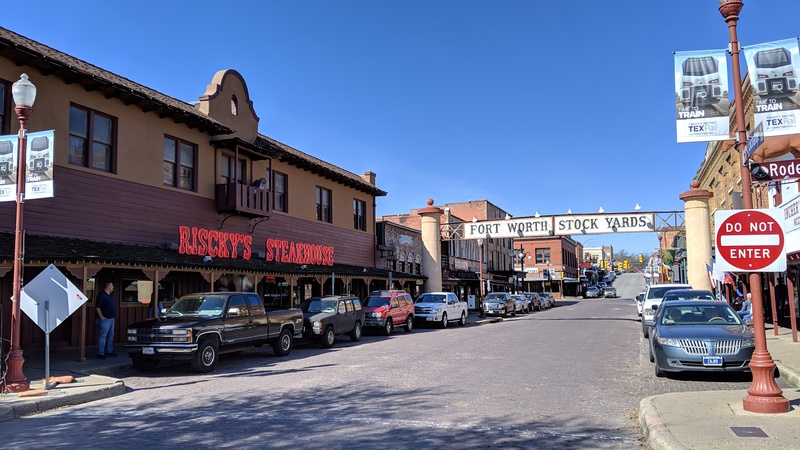 The Fort Worth Stockyards is a registered National Historical District. 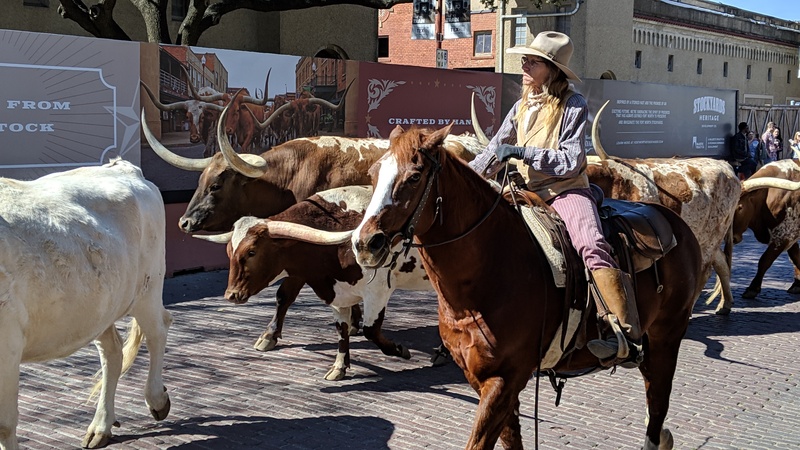 According to their site, Between 1866 and 1890, drovers trailed more than four million head of cattle through Fort Worth. 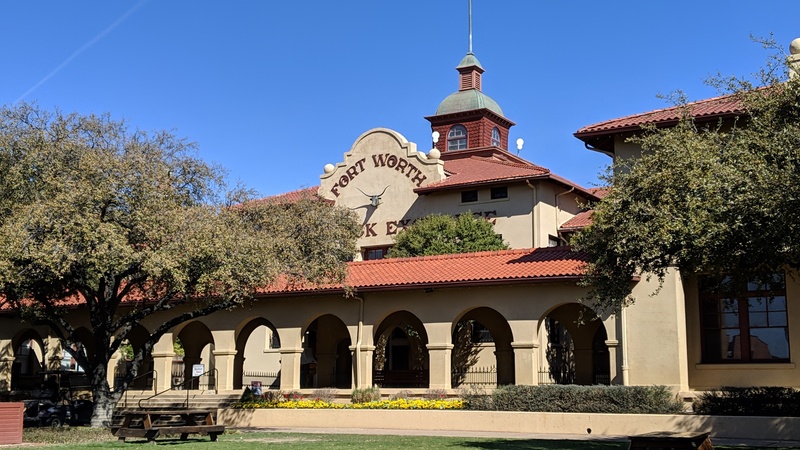 The city soon became known as “Cowtown.” So when you hear people refer to Fort Worth, TX as “Cowtown” there actually is a historical significance to that reference. 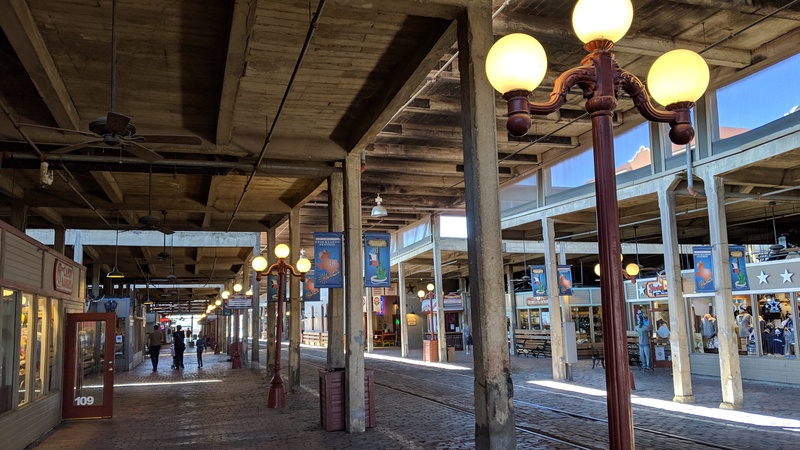 You can read more about the Stockyards vast history with this link. 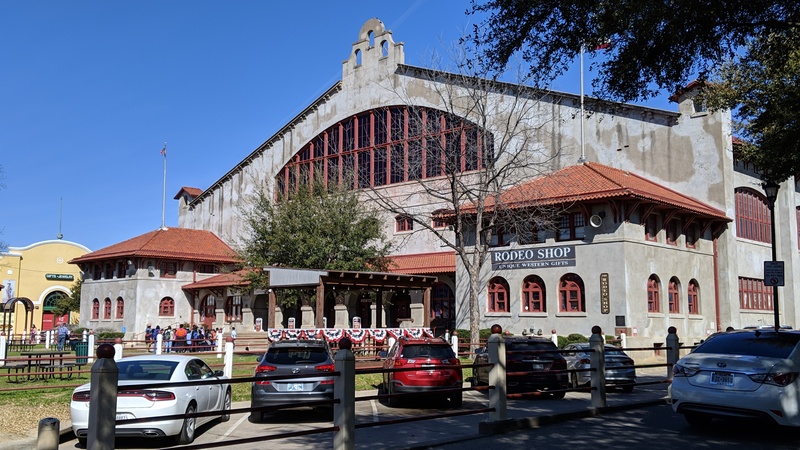 If you want more to do and see, they also have a Wild West show and Rodeo on the weekends that are open for all to enjoy. So plan accordingly. 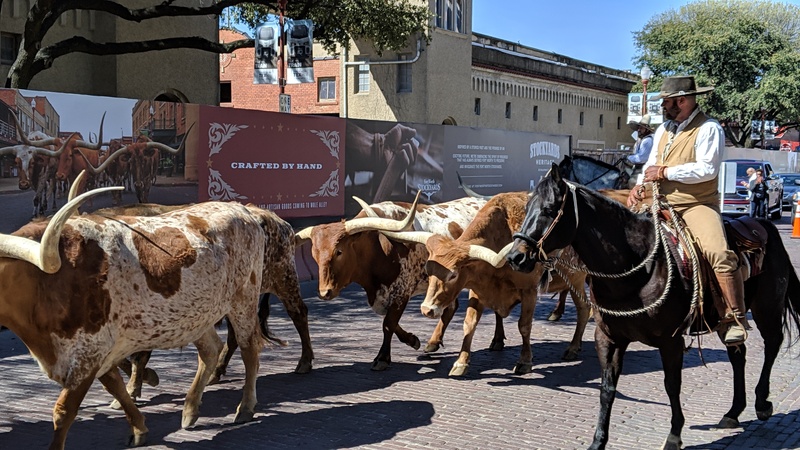 So you have the shopping, restaurants and all this history but what would the stockyards be without it’s very own cattle drive? 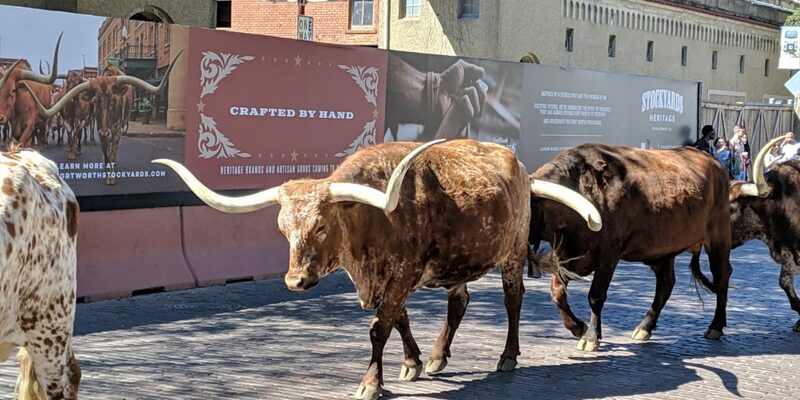 Twice a day, every day of the week, cowboys herd the long horns thru town, or really down a street, for all to oooh and aaah at. We expected a decent cattle drive. Maybe 30-50 head. We were there front and center. David had his 360 camera set up to record. Sadly, in actuality, we got 15 steer moseying down the street. It was still fun to see them up close and personal. To say the horns on these beasts are huge is an understatement. All in all we did have a good day at the Stockyards. If you find yourself in this area we do recommend going there to check it out. The historical buildings. The cattle drive, all be it smaller than expected was something to see. The shopping and restaurants. And on the weekends the Wild West show and Rodeo.